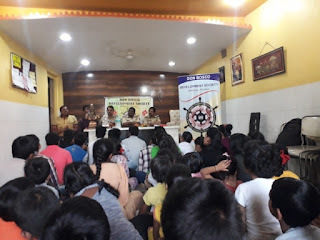 31-Jan-2018, Mumbai: The Don Bosco Development Society (DBDS), Mumbai organized a workshop on ‘CYBER CRIME AND SECURITY’ for the youth from slums in Chembur. The workshop was addressed by a number of Police Officers and Personnel. 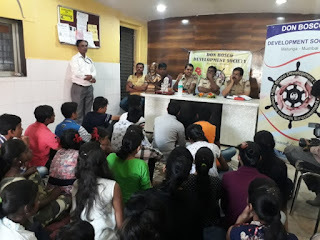 The youth was guided by Mr. Bapu Salunkhe (Police Sub-Inspector), Mr Tushar Chavan (Police Sub-Inspector), Pradip Bhosale (Police Sub-Inspector), Dhananjay Shinde and Samir Mulagi. 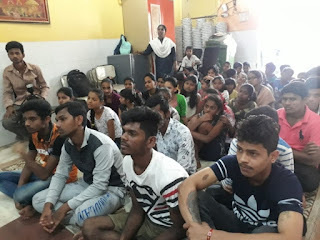 53 young people attended this workshop. The workshop started with welcome address by Mr Sunil Pandare (Staff - DBDS) and introduction of the resource persons. The objective of the workshop was to educate youth on the forms of Cybercrime and legal provisions related to them. Resource person gave guidance on various form of cyber-crimes which are committed by the social media users while using WhatsApp, Facebook, Youtube, internet, e-mails, frauds committed using ATM, Debit card, Credit card etc. They also gave suggestions on how the youth can prevent such crimes and also not become a victim of such illegal actions. A question and answer session was held in the end where the youth asked many questions which were all answered by the resource persons. Ms. Basanti Solanki (DBDS-Staff) made the logistical arrangement for this workshop and also assisted in the registration of youth.